The kit is new, unstarted and includes trucks. This kit is a TT Scale Possum Valley Models resin kit of an outside-bracket composite boxcar. The kit is new, unstarted and includes trucks. This kit is a TT Scale John Harmon Models wood, resin roof and ends, and printed sides kit of an AT&SF 50ft wood sheathed reefer. The kit is new, unstarted and includes trucks. This kit is a TT Scale Possum Valley Models resin kit of a wood-sheathed composite boxcar. The kit is new, unstarted and includes Gold Coast TT trucks. This kit is a TT Scale John Harmon Models wood, resin roof and ends, and printed sides kit of an AT&SF 50ft wood sheathed reefer, in orange with the “Grand Canyon” herald. The kit is new, unstarted and includes trucks. HOT AIR BALLOON. model is made of plastic. everything as you can see in the photo. Berliner Bahnen TT Scale 750 Jahre Berlin Train Set. In celebration of Berlin's 750th anniversary. 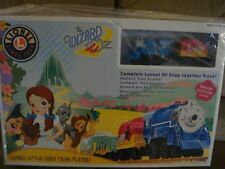 Complete set in original plastic box - engine, tender & 4 cars. Despite of it's age it looks new. I am not sure of the scale it would be just a guess. SCALE: 1:120 MANUFACTURER: Corgi. This is from Corgi's Rail Legends Range and is a Authentic Precision Die-Cast Model. 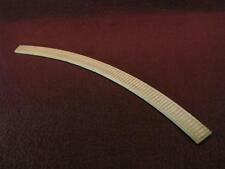 Length of complete train - 17 cm long x 2 cm wide. No pick up available, no exceptions. Kit has had the original wood walls covered with brick paper to make it unique. Large doors are NOT glued in place so you may open them to add a partial interior if desired. Roof is also removable. LIONEL 7-93004 Die-Cast Replica of the #2333 New York Central Hudson F-3 'AA' Diesel Engine. This is a model with detail moving parts. It has NO MOTOR. LIONEL CENTURY CLUB ITEM. Most issues can be rectified through a conversation. Scale: 1:100 ,Suitable for TT scale. 6pcs Round Dining Table With 24 Chairs. This table model set is great miniature furniture for your living room and a excellent decoration for your interior model. ORIGINAL BRAWA HO TROLLEY-BUS CATALOGUE AND SEPERATE FACTORY FLYER FOR THEIR RANGE OF HO GAUGE ELECTRIC CITY TROLLEY BUSSES. GREAT REFERENCE GUIDES. 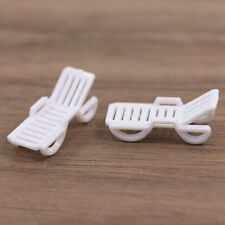 12pcs Sun Loungers Beach Chairs. Scale: 1:100 ,Suitable for TT scale. Perfect for small models and train model layout. 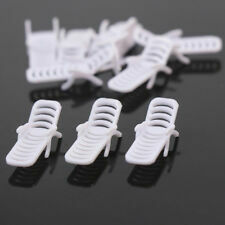 These are high detailed, designed and crafted to enhance the appearance of your model landscape. Here is a lovely set of TT scale people, ready to go. They're beautiful. Berliner Bahnen DB. Produced in GDR. Tillig TT scale item 13556. 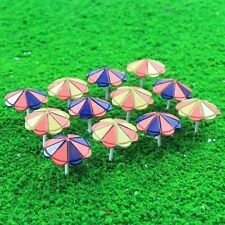 12pcs model sun umbrella parasols. Scale:1:100 ,Suitable for HO~TT scale. These are high detailed, designed and crafted to enhance the appearance of your model landscape. Perfect for small models and train model layout. 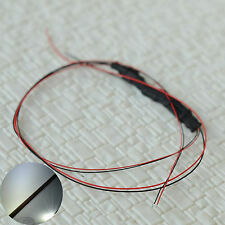 You do not have 12V transformer? No problem - in my store have beneficial for these street lamps powerful 12V power supplies. • Delivery incl. bulbs (lamps 12V) for AC and DC. BONNES ENCHERES A TOUS! VOUS ACHETEZ CE QUE VOUS VOYEZ. The steam engine range consisted of four stationary engines, and a steam engine unit for model boats. The stationary engines were the Minor, Junior, Standard and Major. As you can see from the photographs the condition of the original box, the actual signal, the battery wiring, the braided flex and baker light four way switch are all in remarkably good condition for its age. Brush or Spatula. This item is not a Children's Product and is not intended for use by Children. Woodland Scenics E-Z Water 16 oz c1206 This Is A Bottle of E-Z Water from Woodland Scenics. It's transparent. Create realistic ponds, streams, rivers, and harbours on any layout! Hardens in minutes. Vintage 1998 Hot Wheels Power Express Red 454 Locomotive Train By Mattel WORKS! Hot Wheels logo embossed on front & engine. Hot Wheels logo decal on both sides. TESTED & WORKS! Watch the video. Vintage train set purchased by my grandfather in Germany in 1961. Consists of: small loco, 4 small passenger cars, 3 long passenger cars, large loco (partially disassembled, unknown condition); numerous pieces of track, and 4 switches. Items have been stored in a box for the past 40 years. Big Rugged. New York Central Hudson. Classic Series 1. Each model railway light is about 50mm tall and is made of copper. All model lights are painted in black and give a warm white light. A great electrical model railway extension of your TT miniature world and scenery. This is a Roco 36284 TT Scale Deutsche Bahn AG Diesel Locomotive Series 233 493. Triple headlights and two red tail lights. Motor with flywheel. Drive on six axles. 2 axles with traction tyres. Interface according to PluX16 standards. Coupler pocket according to NEM 358 standards. Model with Henning sound. Manufacturer: Roco. Model Number: 36284. Road Name: Deutsche Bahn AG. MSRP: 211.26. Scale/Era: Other Scales. Model Type: Diesel Loco. Availability: Ships in 2 Business Days!.